Background: In light of therapeutic limitations in Alzheimer's disease (AD), recent alternative or add-on treatment approaches such as non-invasive brain stimulation through transcranial electrical stimulation (tES) have gained attention. Translational studies have postulated that transcranial direct current stimulation (tDCS) is potentially a novel therapeutic option to reverse or stablize cognitive impairments. The aim of this study was to comparatively evaluate the effects of the four main paradigms of tES, including tDCS, transcranial alternative current stimulation (tACS), transcranial random noise stimulation (tRNS), and transcranial pulse current stimulation (tPCS) on beta amyloid 25-35 (Aβ 25-35)-induced memory impairment in male rats submitted to the Morris water maze (MWM) task. Method: To develop AD model in Sprague-Dawley male rats weighing 250-270, the cannula was implanted bilaterally into the hippocampi. Aβ 25-35 (5 μg/2.5 ml/ day) was microinjected bilaterally for 4 days. Then, tES was applied to the animals for 6 days. Subsequently, rats’ learning and memory function was evaluated on day 11-14 in MWM task. Results: Our findings indicated that tDCS, tACS, tRNS reduced escape latency, while such an effect was not observed in tPCS paradigm. In terms of the duration of animals’ presence in the platform quadrant, tDCS and tACS increased the outcome measure. Conclusion: We conclude that tDCS and tACS are more effective than the other two examined paradigms of tES in ameliorating learning and memory impairments. Alzheimer's disease (AD) is a progressive disorder characterized by the loss of neurons and synapses, especially in the hippocampus, which eventually leads to forgetfulness. AD affects cognitive and behavioral functions as a result of synaptic dysfunction. The pathophysiology of Alzheimer's disease roots in the aging-dependent extracellular plaques of beta-amyloid peptides (Aβ) and intercellular neurofebrillary tangles (NFT), consisting of the hyperphosphorilation tau protein [1-3]. The treatment of AD subjects to limitations such as drug metabolism, side effects, or inadequate clinical response. As such, induction of neuroplastic changes by noninvasive techniques such as transcranial electrical stimulation (tES) has gained momentum over the past years . The stimulation is done by applying direct current (DC) over the scalp using electrodes which are encapsulated by sponge embedded in saline or rubber electrodes with guiding gels . This technique can induce long-term and polarityspecific changes in the excitability of the motor cortex in humans . In the most common method, an electrode is placed on a specific area, while the other electrode is placed on another area to complete the flow circuit . The position of the electrode is necessary to determine the orientation and spatial distribution of the current and finally the effectiveness of intervention . This method is shown to provide valuable effects in the treatment of neuropsychiatric disorders such as depression, anxiety, chronic pain, Parkinson's disease and AD, as well as the course of rehabilitation in cognitive impairments . The four main paradigms of tES are transcranial direct current stimulation (tDCS), transcranial alternative current stimulation (tACS), transcranial random noise stimulation (tRNS), and transcranial pulse current stimulation (tPCS). tDCS which is the most widely practiced technique in neurotransmission modulation, depends on the activate electrode polarity to induce cortical excitability changes. The polarity-dependent mechanisms are known to cause: 1) membrane depolarization (increased spontaneous firing through anodal stimulation, or 2) membrane hyperpolarization (reducing spontaneous firing and irritability) with cathodal suppression . TACS is another type of neuromodulation proposed to modify the excitability of the human cortex. This method is a balanced flow of alternating biphasic pulses through alternating electrical charges. Compared to tDCS; tACS allows manipulation of cerebrospinal excitability not only on the basis of severity, but also the applied current frequency. Unlike tDCS, which has inhibitory effects due to polarity, the effects of tACS are determined by the current frequency and independent of the polarization of the electrodes . TRNS is a special form of tACS. During tRNS, a low-frequency alternating current is applied, causing alterations in the intensity and frequency of the flow randomly. Stimulation is biphasic. Like tACS, various forms of noise can be applied based on the frequency range. In most studies, a spectrum of frequencies is used between 1 Hz to 640 Hz (full spectrum) or 101 to 640 Hz (high frequency stimulation). Indeed, 99% of the current generated by the noise stream is in the range of 1 mA . In tPCS; the direct current is discontinued and the two parameters i.e., plus duration (PD) and Inter-pulse interval (IPI) are added. Compared to anodal tDCS, anodal tPCS is a oneway flow of positive pulses separated by predetermined Interpulse intervals. Based on time duration, the range of pulses and IPIs, tPCS produces different degrees of net direct current components . Of the four methods described, tDCS is the most studied with its mechanisms investigated. Clinical studies have shown that tDCS is a potential therapeutic tool. Many studies on the clinical applications of tDCS show that this method is effective in the treatment of many disorders, including those refractories to medication therapy, including post-stroke motor disorder , aphasia after stroke , epilepsy , chronic pain  and Parkinson's disease . Several studies have also shown that the use of tDCS can improve memory in Alzheimer's patients [18,19]. In addition to the existing evidence on clinical benefits in disease conditions, using tDCS in healthy people can improve declarative memory and working memory, as well as other cognitive functions [20,21]. Nevertheless, the exact pathways involved in tDCS effects are not fully understood and further studies are needed for its routine clinical use. It is believed that the application of an electric field with sufficient strength and time causes a rapid increase in the electrical conductivity of cell membranes. This is due to an increase in permeability for small and large ions and molecules. However, knowledge about the effects of neurotransmission, neurochemical markers, neuronal pathways, or neuronal interactions is incomplete. The mechanisms of action of tDCS in AD include altered neuronal activity, changes in blood flow to the brain, changes in osmotic activity of brain, changes in brain functional communication patterns, synaptic and non-synaptic effects, and neurotransmitter modulation . Thus, tDCS might be potentially considered as a suitable add-on treatment for improving cognitive function in AD based on the pathophysiology of the disease. Many studies have addressed the effects of tDCS in patients with AD . The numbers of animal studies which are using this technique to explore the mechanisms of tDCS are increasing . Yu Sh and colleagues revealed that tDCS application after the onset of cognitive dysfunction caused by AD leads to some positive effects on motor behavior . A study in 2016 found that anodal tDCS had beneficial effects on behavioral and spatial memory in animal models of traumatic brain injury (TBI) . Another recent study shows that anodal tDCS increases the long-term potentiation of the hippocampus and improves learning and memory functions . More recently, Ronso et al. showed that tDCS with training improves cognition in anomic AD and frontotemporal dementia . In a case study in 2016, application of tDCS as an adjuvant to the traditional treatment had a stabilizing effect on overall patient cognitive function and led to improved performance on all the secondary outcome measures . Another study also postulated that the synergetic use of tDCS and cognitive training appeared to slow down the cognitive decline in AD . Considering the impairing effects of Aβ on learning and memory and suggested neuroprotective effect of tES, this study was designed to comparatively evaluate the effects of different tES paradigms on learning and memory impairment induced by Aβ in Morris water maze and finally to determine which of the tES paradigms is (are) more effective in this regard. Adult male Sprague-Dawely rats weighing 250–270 g were usedAnimals were maintained at room temperature (25 ± 2°C) under standard 12–12 h light–dark cycle with lights on at 7:00 A.M. Food and water were available ad libitum. The experimental protocols were approved by the ethics committee of Shiraz University of Medical Sciences and the animal care was according to the NIH Guide for the care and use of laboratory animals (IR.SUMS.REC.1395.S974). Fifty six rats were randomly divided into the 7 groups (n=8 in each group) including the control group, the sham group, the Aβ group, the Aβ + anodal tDCS group, the Aβ + tACS group, the Aβ + tRNS group and the Aβ + tPCS group. Aβ 25-35 was purchased from Sigma, USA and electrical stimulation device was purchased from Medina Teb Company, Iran. Ketamine and xylazine were provided by Alfasan Woerden Company, the Netherlands. On the day of surgery, rats were anesthetized with intrapritoneal injection of mixed ketamine (100 mg/kg) and xylazine (10 mg/kg). The rats were mounted into a stereotaxic frame and according to Paxinos brain atlas, stainless steel guide cannula (22-gauge) were implanted bilaterally into the dorsal hippocampi (AP − 3.8, ML ± 2.2, DV − 2.7). To apply electrical stimulation, a plastic tube (inner diameter: 2 mm) was mounted on the right frontal cortex. The cannula and plastic tube were anchored to the skull using stainless screws and acrylic cement. Aβ peptide (25-35) was dissolved in sterile distilled water at a concentration of 2 μg/μl and was stored in −70°C. Aggregation of Aβ 25-35 was done by in-vitro incubation at 37°C for 4 days . In order to inject the drug, a 10 μl Hamilton syringe was connected to the injection cannula through a short piece of polyethylene tube, the injection cannula was inserted 0.5mm below the tip of guide cannula. Aβ 25-35 (5 μg/2.5 ml/day) or its vehicle (distilled water) was injected bilaterally on days 1 to 4. All microinjections were carried out at the speed of 1 ml/min and the needle was left in the place for additional 5 min to minimize the back-flow of the solution. The plastic tube which was placed on the skull surface on surgery day, was filled with sponge and saline. Rats were covered with a towel and the electrodes were inserted. The anodal electrode was placed into the plastic tube above the right frontal cortex. The cathodal electrode, with a larger contact area, was placed onto the ventral thorax with a corset. To reduce the contact impedance, sponges were moistened with saline solution prior to electrical stimulation. TES were applied to the awake and freely moving rats for one week, 20 min per session, with current intensities of 200 μA, the current intensity was ramped for 10 s. Sham stimulation (electrodes were placed, but no stimulation was applied) was performed in the sham and the Aβ groups. Ten days after surgery (day 11), behavioral assessment using the Morris water maze (MWM) task was carried out. Morris water maze apparatus: The water maze has been explained previously . It was a black circular pool with a diameter of 140 cm and a height of 70 cm, filled with 20°C water to a depth of 25cm. The maze was divided into four equal quadrants and release points that were designed at each quadrant as N, E, S, and W. A hidden circular platform (11cm in diameter), was positioned in the center of the southwest quadrant, submerged 1.5 cm beneath the surface of the water. Fixed, extra maze visual cues were present at various locations around the maze (i.e., Computer, a door, a window, bookshelves, posters). A charged coupled device (CCD) camera was mounted above the center of the maze so that the animal motion could be recorded and sent to the computer. The path of animal's swimming was automatically recorded by a computerized system (Noldus EthoVision, v13) (Noldus Company, The Netherlands) and then analyzed by calculating several parameters, e.g. latency to find the platform as well as the swimming speed. Procedure: The rats were trained in a protocol containing of 4 days training session. During the first three days a hidden platform, submerged about 1.5cm below water surface was put in the center of south- west quadrant. The platform location was fixed during those 3 days. A block session consisted off our trials with four different starting points. Each rat was placed in the water facing the wall of the tank at one of the four designated starting points (north, east, South and West) and allowed to swim and find the hidden platform. During each trial, the rat was given 90s opportunity to find the hidden platform. After mounting the platform, the animals were allowed to stay there for 20s until the next trial. Was started. After end of the training, the animal was dried by a towel and returned to its home cage. On day 4, the hidden platform was removed and the retention testing (probe trial) was performed. The probe trial consisted of a 60s free-swim period without a platform and the time spent in the target quadrant was recorded. After probe trial a visible platformcovered by a piece of aluminum foil and not being submerged in water-was placed in another position (the South-East quadrant) to test the rat’s motivation, visual ability and sensorimotor coordination. All behavioral tests and decoding were performed blind. All statistical tests were undertaken using IBM SPSS statistics v22.0. Data were analyzed by repeated measure and one-way analysis of variance (ANOVA) followed by post hoc test for multiple comparison. All results have been shown as means ± Standard Error of Mean (S.E.M). In all statistical comparisons, p<0.05 is considered as significant difference. The effects of vehicle; Aβ or (and) anodal tDCS; tACS; tRNS; tPCS on water maze spatial learning and memory is represented in Figure 1. Figures 1A and 1B show animals’ learning ability during 3 consecutive days of training. Figure 1A The effect of saline, Aβ25-35 or (and) tDCS; tACS; tRNS; tPCS on escape latency. A) The learning patterns of the animals treated by saline, Aβ25-35 or (and) tDCS; tACS; tRNS; tPCS during training sessions. Figure 1B The escape latency to the hidden platform during days 1–3 of training. Data are represented as mean ± SEM. *p<0.05 and **p<0.01 represent the difference between Aβ25-35 and control group. ##p<0.01and ###p<0.001 represents the difference between animals which receive Aβ25-35 and saline and Aβ25-35 + tDCS; tACS; tRNS (n=8). Figure 1A shows the escape latency to reach the hidden platform. This figure demonstrates a negative linear correlation between the escape latency and training days across groups, indicating that all groups have learnt the platform location. Moreover, the repeated measure analysis showed a significant difference of escape latency between groups (p<0.001). Post-hoc Tukey's test following repeated measure analysis, revealed that escape latency in Aβ receiving group is significantly greater than vehicle receiving group (P value<0.001). Treatment with tDCS; tACS and tRNS (p<0.005) reversed Aβ- induced impairment. Treatment with tPCS did not reverse Aβ- induced impairment. To compare how rats, behave in different days of the training, one-way ANOVA was used, and its results showed significant difference between groups in all days (day 1: p value=0.002, F (8,55)=4.331; day 2: p value<0.001, F (8,55)=8.280; day 3: p value<0.001, F (8, 55)=7.945). Figure 2 shows the effects of vehicle or (and) tDCS; tACS; tRNS; tPCS; beta amyloid or (and) tDCS; tACS; tRNS; tPCS administration on mean swimming velocity during days of training. One-way ANOVA of swimming speed did not show significant differences between groups (P value=0.975, F (8, 55)=0.312), which means that the animal's performance is not affected by the swimming speed. 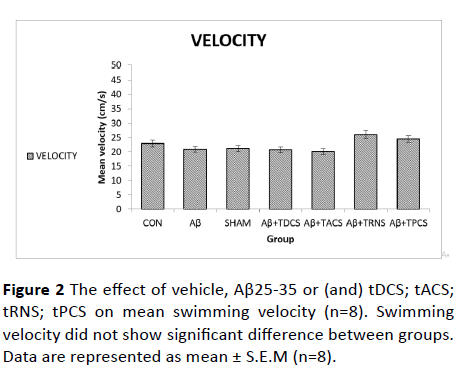 Figure 2: The effect of vehicle, Aβ25-35 or (and) tDCS; tACS; tRNS; tPCS on mean swimming velocity (n=8). Swimming velocity did not show significant difference between groups. Data are represented as mean ± S.E.M (n=8). Figures 3 and 4 shows animals' performance in probe trial test. Figure 3 shows the frequency of animals’ entrance into platform and its proximity. One-way ANOVA revealed a significant difference between groups (P value=0.003, F (8, 55) =4.184). Figure 3: Animals frequency of entrance into the platform and its proximity. This figure shows that Aβ25-35 treatment decreases animals entrance into platform or its proximity area while tDCS and tPCS restored this disturbance. **p<0.01 represents the difference between sham and Aβ25-35 groups. #p<0.05 represents the difference between Aβ25-35 and Aβ25-35 + tDCS and Aβ25-35 + tPCS groups. Data are represented as mean ± S.E.M (n=8). Figure 4: The time spent in the platform area and its proximity. 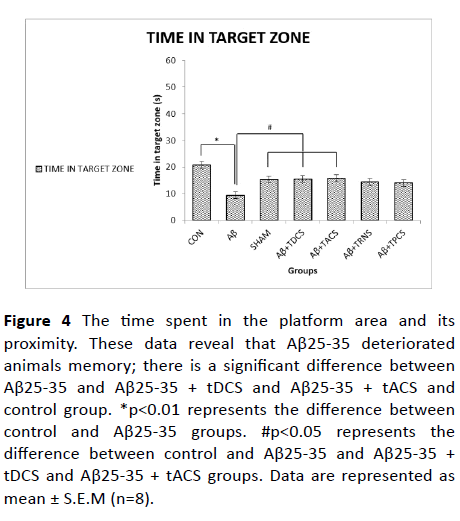 These data reveal that Aβ25-35 deteriorated animals memory; there is a significant difference between Aβ25-35 and Aβ25-35 + tDCS and Aβ25-35 + tACS and control group. *p<0.01 represents the difference between control and Aβ25-35 groups. #p<0.05 represents the difference between control and Aβ25-35 and Aβ25-35 + tDCS and Aβ25-35 + tACS groups. Data are represented as mean ± S.E.M (n=8). Post-hoc Tukey's test showed that the frequency of entry into the platform area and its proximity is significantly decreased in Aβ-treated group, while tDCS and tPCS treatment reversed that memory impairment. Treatment with tACS and tRNS did not show any significant difference as compared to the Aβ-treated group. Figure 4 shows the time spent in the platform area and its proximity. One-way ANOVA revealed a significant difference between groups (P value<0.001, F (8, 55) =6.656). Post-hoc Tukey's test showed that the time spent in the platform area and its proximity is significantly decreased in Aβ-treated group, while tDCS and tACS treatment reversed that memory impairment. Treatment with tRNS and tPCS did not show any significant difference as compared to the Aβ treated group. The effects of vehicle or (and) tDCS; tACS; tRNS; tPCS; Aβ or (and) tDCS; tACS; tRNS; tPCS on animals’ performance in visible platform test is depicted in Figure 5. 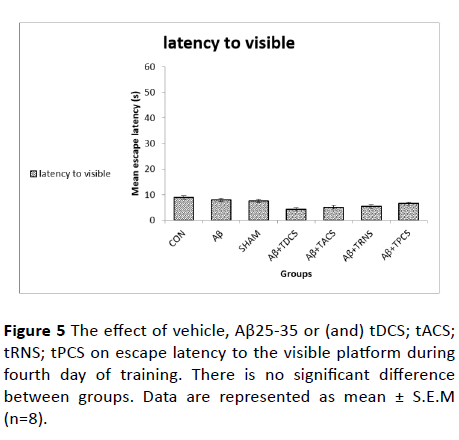 Figure 5 The effect of vehicle, Aβ25-35 or (and) tDCS; tACS; tRNS; tPCS on escape latency to the visible platform during fourth day of training. There is no significant difference between groups. Data are represented as mean ± S.E.M (n=8). The escape latency to reach the visible platform is shown in this Figure 5. One-way ANOVA test on the escape latency to the visible platform did not show significant differences between groups (P value=0.724, F (8, 55)= 0.605). This finding suggests that Aβ did not affect animals' motivation or sensorimotor coordination. Our findings revealed that different paradigms of tES prevented Aβ-induced memory deficit in MWM task. The Aβ- treated rats had longer escape latencies to reach the hidden platform while tES paradigms prevented such a disturbance. MWM is widely used to study the cognitive deficits in the rodent model of AD . In a study conducted in 2014, it was shown that injection of Aβ 25-35 into the hippocampus caused memory impairment in MWM task , which was in agreement to our findings. Since MWM is a behavior test that depends on the hippocampus; In the previous study, it has been shown that the anodal tDCS enhances long term potentiation in the mouse hippocampus and improves memory, spatial learning and the performance of the animals in the MWM task . Previous studies showed that the path of current-flow between the electrodes penetrates not only the cortex but also sub-cortical structures including the hippocampus . In earlier reports, tDCS was shown to affect the brain cortex below the stimulation electrode . The neurophysiological, behavioral and molecular changes investigated in previous investigations were all related to the hippocampal function [35,36]. Indeed, the anodal tDCS enhanced LTP at hippocampal CA3-CA1 synapses and improved the spatial and recognition memory assessed by two validated behavioral tests of the hippocampus-dependent memory tasks, i.e., morris water maze and novel objective recognition test . In our investigation, among the four paradigms studied; tDCS, tACS, tRNS reduced escape latency, while such an effect was not observed in the tPCS method. In terms of the duration of the presence in the platform quadrant, tDCS and tACS increased measure. Since the swimming speeds of all groups were not statistically different, it could be concluded that tES paradigms prevented the Aβ-induced memory deterioration. The finding that Aβ did not influence the visible platform task measures proposes that the impairing effect seen was not related to its effect on animals' visual-motor or motivation. Results from other existing behavioral and histological reports indicate that the proposed repetitive anodal tDCS treatment can protect spatial learning and memory dysfunction of Aβ 1–40-lesioned AD rats . Our findings confirmed the results of the previous studies, with the difference that in this study, six sessions of electrical stimulation were carried out. Additionally, tDCS; tACS and tRNS intervention ameliorated the animals’ behavior. Unlike tDCS, the other three stimulus patterns had not been much studied earlier while the current study examined the effect of the three other stimulation paradigms on spatial memory. Earlier studies have shown that tACS can modulate cortical excitability, Electroencephalography (EEG) oscillations and cognitive processes [39-41]. In addition, it has been shown that tACS can modulate brain oscillations and affect the cognitive functions [42,43]. It is also said that cognitive functions change with a selective intervention in brain oscillations . In the present research, the effect of this paradigm on spatial memory was determined. Abnormal brain rhythms are associated with pathological conditions and such rhythms vary in AD patients . As such research is trying to unveil the effects of brain rhythm modulations through tACS paradigm on neurobehavioral outcomes in disease conditions such as AD . The prevailing hypothesis about the action of tACS is that alternating fields can increase or decrease the power of oscillatory rhythms in the brain, and in a frequency-dependent manner, through synchronizing and desynchronizing neuronal networks . This study could at least partly document the positive effects of tACS in that respect. Previous studies have shown that transcranial high frequency tRNS increases the brain excitability [46,47]. In a study by Paul Mulquiney et al., it has been shown that tRNS can improve working memory performance . Likewise, our study revealed the effect of tRNS on the improvement of the performance of memory-impaired rats in training session of MWM task. On the other hand, previous reports have indicated that anodal tPCS, with a specific pulse duration, has significant effects on cortical excitability compared to tDCS in healthy people . Meanwhile, in our study, tPCS in comparison with the other three paradigms, had no significant effects on the escape latency and the time spent in the platform area. This might have been due to the number of stimulation sessions or the power of the electrical current to reach the underneath structures or perhaps due to the type of disorder or behavioral test studied. Nevertheless, tPCS had a significant impact on the entrance frequency to the platform quadrant. Regarding the number of sessions, the results of our study showed that tDCS, tACS and tRNS paradigms had better effects in different stages of MWM task. Based on our findings and those of the previous studies, the effect of tDCS on the improvement of Aβ-induced memory impairment in MWM task appears to be well supported. Additionally, the current investigation proposed that other stimulation paradigms may retain efficiency in remediating cognitive impairments in a rodent model of AD. Overall, the results of this study showed that the use of multiple sessions of different paradigms of tES can reverse the memory impairment induced by Aβ in a rat model; that tDCS and tACS had better effects on animal behavior in morris water maze task. Therefore, based on such evidence, it could be expected that in addition to tDCS application in the treatment of AD, other stimulation paradigms may be considered as add-on neuromodulation strategies in AD. More research is of course required to postulate such an impact in clinical settings. This work was derived from the PhD thesis of Amir Hossein Zarifkar and supported by a grant (number 12527) from Shiraz University of Medical Sciences. Lopes da Silva S, Vellas B, Elemans S, Luchsinger J, Kamphuis P, et al. (2014) Plasma nutrient status of patients with Alzheimer's disease: Systematic review and meta-analysis. Alzheimers Dement 10: 485-502. Solfrizzi V, Panza F (2014) Mediterranean diet and cognitive decline. A lesson from the whole-diet approach: what challenges lie ahead? J Alzheimers Dis 39: 283-286. Affoo RH, Foley N, Rosenbek J, Shoemaker JK, Martin RE (2013) Swallowing dysfunction and autonomic nervous system dysfunction in Alzheimer's disease: A scoping review of the evidence. J Am Geriatr Soc 61: 2203-2213. Bauer M, Langer O, Dal-Bianco P, Karch R, Brunner M, et al. (2006) A positron emission tomography microdosing study with a potential antiamyloid drug in healthy volunteers and patients with Alzheimer's disease. Clin Pharmacol Ther 80: 216-227. Vanneste S, Langguth B, De Ridder D (2011) Do tDCS and TMS influence tinnitus transiently via a direct cortical and indirect somatosensory modulating effect? A combined TMS-tDCS and TENS study. Brain Stimul 4: 242-252. Guleyupoglu B, Schestatsky P, Edwards D, Fregni F, Bikson M (2013) Classification of methods in transcranial electrical stimulation (tES) and evolving strategy from historical approaches to contemporary innovations. J Neurosci Methods 219: 297-311. Baudewig J, Nitsche MA, Paulus W, Frahm J (2001) Regional modulation of BOLD MRI responses to human sensorimotor activation by transcranial direct current stimulation. Magn Reson Med 45: 196-201. Bikson M, Grossman P, Thomas C, Zannou AL, Jiang J, et al. (2016) Safety of transcranial direct current stimulation: Evidence based update 2016. Brain Stimul 9: 641-661. Reato D, Rahman A, Bikson M, Parra LC (2013) Effects of weak transcranial alternating current stimulation on brain activity-a review of known mechanisms from animal studies. Front Hum Neurosci 7: 687. Antal A, Herrmann CS (2016) Transcranial alternating current and random noise stimulation: Possible mechanisms. Neural Plast 2016: 3616807. Jaberzadeh S, Bastani A, Zoghi M, Morgan P, Fitzgerald PB (2015) Anodal transcranial pulsed current stimulation: The effects of pulse duration on corticospinal excitability. PLoS One 10: e0131779. Edwards DJ, Krebs HI, Rykman A, Zipse J, Thickbroom GW, et al. (2009) Raised corticomotor excitability of M1 forearm area following anodal tDCS is sustained during robotic wrist therapy in chronic stroke. Restor Neurol Neurosci 27: 199-207. Monti A, Cogiamanian F, Marceglia S, Ferrucci R, Mameli F, et al. (2008) Improved naming after transcranial direct current stimulation in aphasia. J Neurol Neurosurg Psychiatry 79: 451-453. Nitsche MA, Paulus W (2009) Noninvasive brain stimulation protocols in the treatment of epilepsy: A current state and perspectives. Neurotherapeutics 6: 244-250. Boggio PS, Amancio EJ, Correa CF, Cecilio S, Valasek C, et al. (2009) Transcranial DC stimulation coupled with TENS for the treatment of chronic pain: A preliminary study. Clin J Pain 25: 691-695. Benninger DH, Lomarev M, Lopez G, Wassermann EM, Li X, et al. (2010) Transcranial direct current stimulation for the treatment of Parkinson's disease. J Neurol Neurosurg Psychiatry 81: 1105-1111. Boggio PS, Ferrucci R, Mameli F, Martins D, Martins O, et al. (2012) Prolonged visual memory enhancement after direct current stimulation in Alzheimer's disease. Brain Stimul 5: 223-230. Boggio PS, Valasek CA, Campanhã C, Giglio AC, Baptista NI, et al. (2011) Non-invasive brain stimulation to assess and modulate neuroplasticity in Alzheimer's disease. Neuropsychol Rehabil 21: 703-716. Javadi AH, Walsh V (2012) Transcranial direct current stimulation (tDCS) of the left dorsolateral prefrontal cortex modulates declarative memory. Brain Stimul 5: 231-241. Andrews SC, Hoy KE, Enticott PG, Daskalakis ZJ, Fitzgerald PB (2011) Improving working memory: The effect of combining cognitive activity and anodal transcranial direct current stimulation to the left dorsolateral prefrontal cortex. Brain Stimul 4: 84-89. Hansen N (2012) Action mechanisms of transcranial direct current stimulation in Alzheimer's disease and memory loss. Front Psychiatry 3: 48. Brunoni AR, Fregni F, Pagano RL (2011) Translational research in transcranial direct current stimulation (tDCS): A systematic review of studies in animals. Rev Neurosci 22: 471-481. Yu SH, Park SD, Sim KC (2014) The effect of tDCS on cognition and neurologic recovery of rats with Alzheimer's disease. J Phys Ther Sci 26: 247-249. Yoon KJ, Lee YT, Chae SW, Park CR, Kim DY (2016) Effects of anodal transcranial direct current stimulation (tDCS) on behavioral and spatial memory during the early stage of traumatic brain injury in the rats. J Neurol Sci 362: 314-320. Podda MV, Cocco S, Mastrodonato A, Fusco S, Leone L, et al. (2016) Anodal transcranial direct current stimulation boosts synaptic plasticity and memory in mice via epigenetic regulation of Bdnf expression. Sci Rep 6: 22180. Roncero C, Kniefel H, Service E, Thiel A, Probst S, et al. (2017) Inferior parietal transcranial direct current stimulation with training improves cognition in anomic Alzheimer's disease and frontotemporal dementia. Alzheimers Dement (NY) 3: 247-253. Andrade SM, Pereira TCL, Fernandez-Calvo B, Araújo RCN, Alves NT (2016) Adjuvant transcranial direct current stimulation for treating Alzheimer's disease: A case study. Dementia Neuropsychologia. Penolazzi B, Bergamaschi S, Pastore M, Villani D, Sartori G, et al. 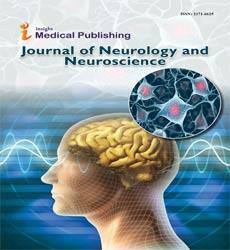 (2015) Transcranial direct current stimulation and cognitive training in the rehabilitation of Alzheimer disease: A case study. Neuropsychol Rehabil 25: 799-817. Ghasemi R, Zarifkar A, Rastegar K, Maghsoudi N, Moosavi M (2014) Insulin protects against Abeta-induced spatial memory impairment, hippocampal apoptosis and MAPKs signaling disruption. Neuropharmacology 85: 113-120. Zarifkar A, Choopani S, Ghasemi R, Naghdi N, Maghsoudi AH, et al. (2010) Agmatine prevents LPS-induced spatial memory impairment and hippocampal apoptosis. Eur J Pharmacol 634: 84-88. Qing H, He G, Ly PT, Fox CJ, Staufenbiel M, et al. (2008) Valproic acid inhibits Abeta production, neuritic plaque formation, and behavioral deficits in Alzheimer's disease mouse models. J Exp Med 205: 2781-2789. Bolzoni F, Baczyk M, Jankowska E (2013) Subcortical effects of transcranial direct current stimulation in the rat. J Physiol 591: 4027-4042. Ramaraju S, Roula MA, McCarthy PW (2018) Modelling the effect of electrode displacement on transcranial direct current stimulation (tDCS). J Neural Eng 15: 016019. Rohan JG, Carhuatanta KA, McInturf SM, Miklasevich MK, Jankord R (2015) Modulating hippocampal plasticity with in vivo brain stimulation. J Neurosci 35: 12824-12832. Bennabi D, Pedron S, Haffen E, Monnin J, Peterschmitt Y, et al. (2014) Transcranial direct current stimulation for memory enhancement: From clinical research to animal models. Front Syst Neurosci 8: 159. Vorhees CV, Williams MT (2014) Assessing spatial learning and memory in rodents. ILAR J 55: 310-332. Yu X, Li Y, Wen H, Zhang Y, Tian X (2015) Intensity-dependent effects of repetitive anodal transcranial direct current stimulation on learning and memory in a rat model of Alzheimer's disease. Neurobiol Learn Mem 123: 168-178. Antal A, Paulus W (2013) Transcranial alternating current stimulation (tACS). Front Hum Neurosci 7: 317. Herrmann CS, Rach S, Neuling T, Strüber D (2013) Transcranial alternating current stimulation: a review of the underlying mechanisms and modulation of cognitive processes. Front Hum Neurosci 7: 279. Marshall L, Binder S (2013) Contribution of transcranial oscillatory stimulation to research on neural networks: an emphasis on hippocampo-neocortical rhythms. Front Hum Neurosci 7: 614. Basar E, Başar-Eroglu C, Karakaş S, Schürmann M (2001) Gamma, alpha, delta, and theta oscillations govern cognitive processes. Int J Psychophysiol 39: 241-248. Herrmann CS, Munk MH, Engel AK (2004) Cognitive functions of gamma-band activity: Memory match and utilization. Trends Cogn Sci 8: 347-355. Sejnowski TJ, Paulsen O (2006) Network oscillations: Emerging computational principles. 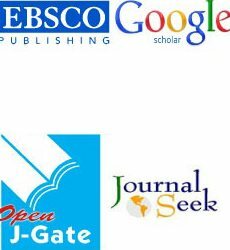 J Neurosci 26: 1673-1676. Montez T, Poil S, Jones BF, Manshanden I, Verbunt JPA, et al. (2009) Altered temporal correlations in parietal alpha and prefrontal theta oscillations in early-stage Alzheimer disease. Proc Natl Acad Sci USA 106: 1614-1619. Laczo B, Antal A, Rothkegel H, Paulus W (2014) Increasing human leg motor cortex excitability by transcranial high frequency random noise stimulation. Restor Neurol Neurosci 32: 403-410. Terney D, Chaieb L, Moliadze V, Antal A, Paulus W (2008) Increasing human brain excitability by transcranial high-frequency random noise stimulation. J Neurosci 28: 14147-14155. Mulquiney PG, Hoy KE, Daskalakis ZJ, Fitzgerald PB (2011) Improving working memory: Exploring the effect of transcranial random noise stimulation and transcranial direct current stimulation on the dorsolateral prefrontal cortex. Clin Neurophysiol 122: 2384-2389.